Don’t miss this week’s Times for the chance to win a Game of Thrones Afternoon Tea for four at Ballygally Castle. 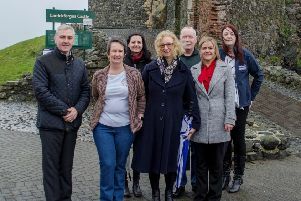 Hastings Hotels has teamed up with the Larne, Carrick and Newtownabbey Times to offer the tasty treat inspired by the fantasy lands of Winterfell, the Iron Islands, Kings Landing and the Stormlands in the fantasy epic TV show. Seven Kingdom-inspired delights on offer include Lannister egg, Baratheon Bread, Little Finger’s Chicken Caesar wrap, Jon Snow Cakes, and Dothraki Trifle with mini Dragon’s eggs. The feast is sure to delight fans of the world-renowned show as well as those who love the indulgence of a delicious afternoon tea. To enter, check out your copy of this week’s Times. The closing date for receipt of entries is 1pm on Friday September 18.